Eclectic Paperie: SHHH...A little surpise is coming! 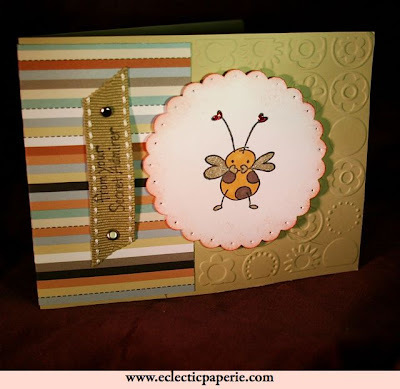 Did we tell you that eP loves Stampendous! 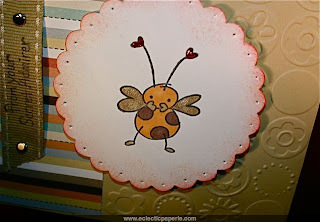 Here's one of those cute bees from the Bee Happy Collection that was included in the last eP Coterie offering. It's a simple card with a little more masculine feeling but a little mischief and fun, too. I had to try some of the Copic Markers and I love the fact that they don't bleed or streak even on a small image like this. Needed to add a little SPARKle and shimmer with a little Christmas Red Stickles on the antenna hearts(how cute are those) and the Stardust Jelly Roll Pen over the wings(I did color the wings with the Lionet Gold(Y28) Copic Marker first and then used the Gelly Roll pen on top of it). The Palette Noir Black ink works well on the Stampin' Up ribbon and didn't bleed through nor did it fade. This little bee is just a teaser for tomorrow's big surprise. So, make sure that you are signed up for our newsletter, the eclectic Expose. Hope you are around this weekend 'cause eclectic Paperie will be celebrating it's 1st anniversary. ooo' this little guy is SO CUTE!!! I can't wait to celebrate eP's anniversary!!! woooHOOOO!!!! !